Phalaenopsis is a very beautiful and generally not especially demanding Orchid. Compared with other orchids, this inhabitant of greenhouses and window sills seems almost Spartan. However, care has some peculiarities. This plant needs proper watering, cut off the dried tips of the leaves after flowering to cut the flower stalk. Circumcision may be required if the plant looks unhealthy. - ground sulfur or powdered charcoal. 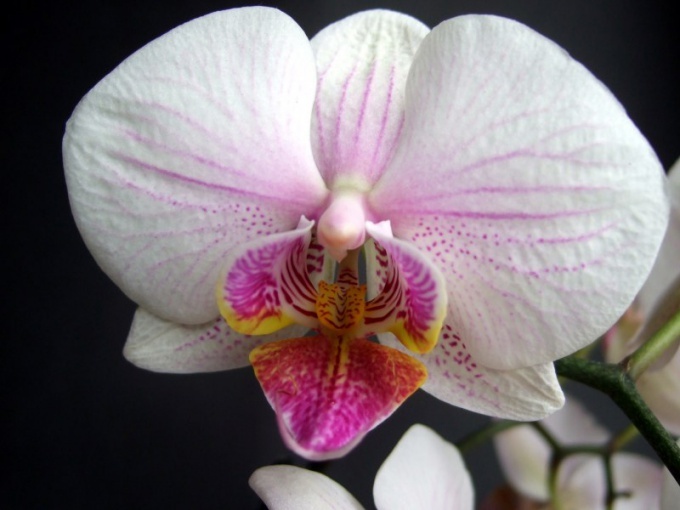 The need to cut a Phalaenopsis may occur as soon as you purchase it. In a flower shop or greenhouse the buyer does not always have the opportunity to explore the roots of plants. The dried tips of the leaves can be a result of natural plant development, and the result of the disease roots. If your flower growing in a transparent pot, it is possible not to dig up and examine the roots through the wall. They should be silvery green color. Old roots are often yellow. The Phalaenopsis is often sold in opaque pots. In this case, be sure to inspect it upon purchase. It should not wobble. If the plant sits loosely — probably has rotten roots. Dig Phalaenopsis. Carefully remove the substrate. Inspect the roots. Rotten cut off with a scalpel or sharp knife. A surgical instrument to better handle alcohol. Cut the remains of old leaves. Sprinkle all slices powdered sulfur or charcoal. You can buy them in the store for gardeners. Cropped plant must not be planted in the substrate or put into the water. The remaining roots can rot. Dry Phalaenopsis, allowing him to lie on the air at least a day or two. Sometimes you have to cut all the roots, but this drastic measure may be applied only when the surface of decay is very large. After such drastic surgery, the plant can a very long time to show any signs of life. It is very often necessary to cut the peduncle. It is necessary not only to plant has given new kidneys, but also for vegetative propagation. In the second case, fill the clear jar with sphagnum. Sphagnum pre-rinse with boiled water, and cut off, leaving only the greens. Jar 0.5 litre wash with detergent and rinse thoroughly with boiled water too. Sphagnum put vertically and fill the jar to half the volume. Gently water the sphagnum to water it absorbed and did not get to the bottom of the jar. Cut stems and treat it with diluted alcohol. In any case, you cannot use pure alcohol should be diluted to 50-70% of concentration. Cut the stems into pieces so that the kidney was in the center and side parts of 1.5-2 cm Slices, sprinkle powdered sulfur or charcoal. Put the pieces of stems of the sphagnum moss and seal the jar. Watch what happens inside. Time to remove the dead pieces of the peduncle. Among the cut parts will be such that will give the new plants. If you need to trim the Orchid for it to bloom again until the end of flowering. Handle the scalpel with alcohol. Cut Phalaenopsis on the third kidney. Try not to damage the stem. The cut stems can be treated powdered sulfur or charcoal. After some time, formed a new spike that will give a more abundant flowering.